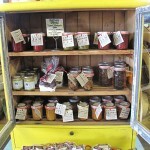 At the Sonoma-Marin Fair last year I bought a jar of spicy pepper jam at the Farm to Table Showcase. It was delicious, with just the right balance of spice and sweetness. We ate it on artisan bread with homemade fromage blanc. It came from a place called Jimtown. I’d never been there but have had it on my mind ever since. 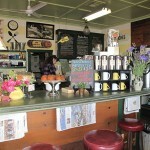 Finally, almost a year later, we made a trip to this quaint country store in the heart of Alexander Valley and discovered several gastronomic treats. Jimtown Store is located about seven miles east of Healdsburg on Highway 128 and if you drive too fast you can easily miss it, but this small yellow building with green trim is a local landmark and has been for over 100 years. We arrived for breakfast, not their busy time of day, which was perfect. It was just us and some straggling locals. We ordered up a couple of baked egg sandwiches with melted provolone cheese, Romesco sauce, and bacon served on warm focaccia bread. The place had a fun atmosphere; a blend of old country store and gourmet café with touches of eclectic Americana and a bit of international flare. They sold, among many things, antiques, oil cloth, hand-woven baskets, old fashioned toys, birdfeeders and, of course, homemade preserves. I opened a copy of their cookbook and was hooked after reading recipes for “Indian Cashews” and “Crisp Gilled Dates with Manchego & Bacon”, not to mention “Pan-fried Petaluma Duck Burgers”! 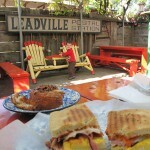 We devoured our delicious sandwiches on their cozy back patio. It was an ideal start to our day. Just south of Jimtown we stopped at the Sausal Winery on Chalk Hill Road, a family owned winery with some of the oldest zinfandel vines in the valley, planted back in 1877. 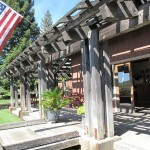 This is the kind of winery I really enjoy visiting: small, unpretentious, friendly, and has good wine. It reminded me of how more wine tasting experiences “used to be”. We left with a bottle of their Sogno Della Famiglia (Family Dream), a blend of zinfandel, sangiovese, and carignane that is a tribute to Leo Sausal, the owner’s father, who passed away in 1973 before his dream of converting the farm to a winery could be realized. The Alexander Valley is a beautiful place to just drive, which we did plenty; stopping to taste good wine is an added bonus. 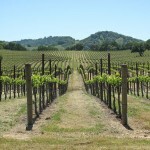 Getting to stop and taste good wines from all over Sonoma and beyond is even better! At the end of our day we did a final round of tasting at Locals in Geyserville. As I said, I like the smaller wineries and Locals is a cooperative of ten wineries that produce only a few hundred cases each. They have a selection of over 70 wines from around Sonoma as well as a few other California AVAs and the odd international bottle or two. Flights are served by varietal which provide the perfect opportunity to really put your taste buds to the test and figure out what you enjoy. And, the hospitality makes you feel, well, like a local. Wonderful food, worldly wines, friendly people, and the picturesque Alexander Valley: who would have known that such a great day could spring from the label on a bottle of spicy pepper jam? Jemetha, another great piece. You know, I almost don’t want to read your blog because after I read it, I realize how great my weekend could have been, versus what it actually was. Seriously though I love your writing and it gives my wife and I inspiration and ideas for our own adventures. Thank you! I’m glad to know you’re finding inspiration in my blog. It is good motivation for me keep writing! 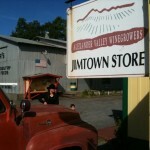 I’d never heard of Jimtown but plan to visit now. Thanks for the wonderful article loaded with enthusiastic information.